First time ever on CD in North America! 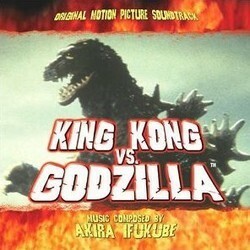 Presenting the original motion picture soundtrack to the classic 1962 Toho Studios monster thriller 'King Kong Vs. Godzilla.' Legendary composer Akira Ifukube ('Godzilla') fashions a spellbinding orchestral score to chronicle this one-of-a-kind battle between two of filmdom's most beloved creatures. Remastered from Toho Studio vault sources, with bonus tracks and featuring exclusive liner notes, this is the definitive release of Ifukube's amazing score. Godzilla celebrated his 50th Anniversary in 2004 with many worldwide events and King Kong has seen a resurgence of interest with the new Peter Jackson film and a new DVD release of the original movie.